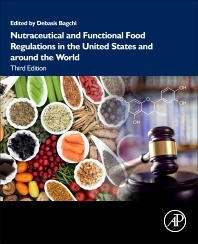 Nutraceutical and Functional Food Regulations in the United States and Around the World, Third Edition addresses the latest regulatory requirements designed to ensure the safe production and delivery of these valuable classes of foods. The book is well recognized, showing how food and nutrition play a critical role in enhancing human performance, and in overall health. The book discusses the scope, importance and continuing growth opportunities in the nutraceutical and functional food industries, exploring the acceptance and demand for these products, regulatory hurdles, the intricate aspects of manufacturing procedures, quality control, global regulatory norms and guidelines. Researchers and producers in functional foods and nutraceutical industries worldwide, particularly multi-national companies and those who would like to do business in other countries and need information on regulatory issues.